Pastor Floyd Freed in 1974. Source: Mennonite Heritage Center (Harleysville,PA) photo. The Log Chapel at Putnam Station, in upstate New York near the Vermont border, has a varied background. During the Depression there was only one church in Putnam Station, and Rev. J. S. Vance, a Presbyterian, realized that the folks from the other side of town were not able to get to services. Rev. and Mrs. Vance started services in a tent during the summer of 1933. One acre of land was then donated for construction of a chapel. The logs, also donated, were taken from a nearby mountain. Construction began in the fall of 1933 and was completed within 14 days. The opening service was held 10 November 1933, with a formal dedication service taking place on 11 November 1934, led by Rev. and Mrs. Vance. From 1938 to 1962 pastors served at this little country church from Hawthorne Gospel Crusade in New Jersey and Word of Life Fellowship in New York. In the early 1960s a former pastor from the Chapel met with Lester Moyer of Quakertown, Pennsylvania, asking if the Mennonite Church would consider an outreach at Log Chapel, which had been closed for a number of years. The Franconia Mennonite Board of Missions and Charities contacted a Mennonite church in Vermont to conduct a Vacation Bible School (VBS) across Lake Champlain in northern New York. For the next several years, Pastor Jacob and Ruth Rittenhouse, along with Abram and Elsie Wismer and other teachers from Franconia Mennonite Conference, held two weeks of VBS in the town hall at Putnam Station. Floyd and Edith Freed answered God’s call to move north in November 1966. They continued with a VBS outreach and settled into the community, getting acquainted with persons who had been connected to the Chapel before it closed. Joan Rock and her family became close friends and supporters during the 33 years that the Freeds served there. Joan became a strong pillar of the church at Log Chapel. Dennis and Dorothy Detweiler were asked by the Franconia Mission Board to join the Freeds in their endeavors of outreach, and they served at Log Chapel from January 1970 to August 1988. Log Chapel in 2009. Source: Photo by Dorothy Wismer Detweiler. After receiving permission from the former trustees, the Log Chapel was opened once again, on 19 July 1970. In 1972 Floyd and Edith Freed were asked by the principal of the local elementary school to provide weekly Bible classes. About 80 percent of the school enrollment were ‘bused’ to the local town hall, fire house and finally to Log Chapel’s new and improved addition. Bible Club was held weekly for 16 years. Vacation Bible School continued to be a strong outreach in the community, along with youth activities, ladies’ Bible studies, and sewing projects for Mennonite Central Committee. 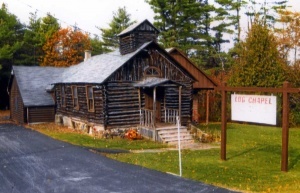 While the church planters were Mennonites from Pennsylvania, Log Chapel functioned as a "community church," with outreach being the focal point, as it had been since the chapel was built in 1933. Attendance grew from 20 in 1970 to approximately 60 by 1988, outgrowing the small building. Laverne and Lorraine Freed of Spring Mount, Pennsylvania moved in 1976 to the neighboring town of Clemons and lived there until 1998. In 1992 Laverne’s carpentry gifts were instrumental in building a new structure at Log Chapel for a larger sanctuary and more classrooms. In 2013 the first Log Chapel still stood bravely in front of the new additions and God still led willing persons to fill the leadership needs of the congregation. Log Chapel Fellowship celebrated their 75th Anniversary in November 2009, and continued under local leadership as a community church. While supported for some years by the Franconia Mennonite Mission Board, the congregation never officially joined Franconia Conference as a member congregation. Detweiler, Dorothy Wismer. 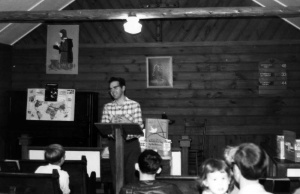 "Log Chapel Fellowship (Putnam Station, New York, USA)." Global Anabaptist Mennonite Encyclopedia Online. May 2013. Web. 20 Apr 2019. http://gameo.org/index.php?title=Log_Chapel_Fellowship_(Putnam_Station,_New_York,_USA)&oldid=115993. Detweiler, Dorothy Wismer. (May 2013). Log Chapel Fellowship (Putnam Station, New York, USA). Global Anabaptist Mennonite Encyclopedia Online. Retrieved 20 April 2019, from http://gameo.org/index.php?title=Log_Chapel_Fellowship_(Putnam_Station,_New_York,_USA)&oldid=115993. This page was last modified on 17 March 2014, at 13:55.